This piece from Pfister has an all-around look that works well with many bathroom styles. If you want to renew the look of your bathroom, this dual-control faucet is perfect. Its deck mounted design fits with many sinks and isn't hard to install. This WaterSense certified faucet uses less water but gives you the same clean every time. When looking for an airy, sanctuary feel in a bathroom, look no further than the Heritage Collection. Its a timeless collection of quality design and smart engineering. A vintage look with crisp clean lines makes Heritage a classic, traditional collection. Its relaxing effect will exceed your expectations. All items are design matched to coordinate with the Townsend or Heritage Fixtures. Also available in store by special order only see store for details. The graceful shoreline and sturdy cliffs of the Amalfi Coast inspired the Positano collection by Avanity. The fluid curves of the spout contrasted with the solid lines of the handles create a design that embodies both drama and function. This 8 in. 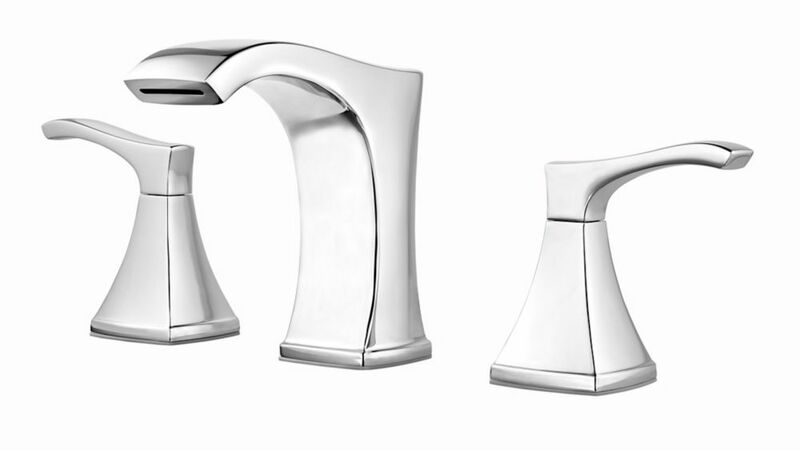 widespread 2-handle bath faucet features a crisp Chrome finish. The Triton collection by Avanity resides at the inflection point between transitional and contemporary design. The angular lever handles display crisp lines that build a subtle contrast with the fluid curve of the spout. This 8 in. widespread 2-handle bath faucet features a dazzling Chrome finish. Venturi 8-inch Widespread Bathroom Faucet in Chrome Finish This piece from Pfister has an all-around look that works well with many bathroom styles. If you want to renew the look of your bathroom, this dual-control faucet is perfect. Its deck mounted design fits with many sinks and isn't hard to install. This WaterSense certified faucet uses less water but gives you the same clean every time. Venturi 8-inch Widespread Bathroom Faucet in Chrome Finish is rated 1.0 out of 5 by 1. Rated 1 out of 5 by eric from Ejects water with 2 much force, splash everywhere To be fair, we didn't buy this. It was there when we moved in. The spout design is not practical at all. It's a bar instead of traditional style, and this causes the water to come out with a lot of force, converging into a single spot. When the water hits your hands, it splashes everywhere. Literally every single time we wash our hands we have to wipe off the backslash wall, and we have a very deep sink. This looks good, but like many faucets that "look good", it's not practical for everyday use. Is this faucet considered a tub filler? Pfister Model: F049VNCC is a bathroom faucet that should be installed on a sink and not a tub.